I always believed that love is what a person perceives about it. For some people, love is sacrifice while for some it is extreme demand. Some say it is an emotion while others proclaim it to be a decision. Nevertheless, all of them are right. Just that its the way they think about love. Perhaps, the same person can perceive the same love in different tones or languages. Here I would confine myself to the concept of love languages given by Gary Chapman. And before I move on to describing the five love languages, let me talk about some concepts, the book explored beautifully. The most prominent one is ‘Falling in Love’. As per the book, the eternality of the ‘in-love’ experience is fiction, not fact. Dr. Dorothy Tennov, a psychologist, has done long range studies on the in-love phenomenon. After studying scores of couples, she concluded that the average life span of a romantic obsession is two years. If it is a secretive love affair, it may last a little longer. Eventually, however, we all descend from the clouds and plant our feet on earth again. Our eyes are opened and we see the warts of the other person. Some researchers, among them psychiatrist M. Scott Peck and psychologist Dorothy Tennov, have concluded that the in-love experience should not be called ‘love’ at all. Dr. Tennov coined the word limerance for the in-love experience in order to distinguish that experience from what she considers real love. Dr. Peck concludes that the falling-in-love experience is not real love for three reasons. First, falling in love is not an act of the will or a conscious choice. No matter how much we may want to fall in love, we cannot make it happen. On the other hand, we may not be seeking the experience when it overtakes us. Often, we fall in love at inopportune times and with unlikely people. Second, falling in love is not real love because it is effortless. Whatever we do in the in-love state requires little discipline or conscious effort on our part. As the instinctual nature of the bird dictates the building of a nest, so the instinctual nature of the in-love experience pushes us to do outlandish and unnatural things for each other. Third, one who is ‘in-love’ is not genuinely interested in fostering the personal growth of the other person. The in-love experience does not focus on our own growth nor on the growth and development of the other person. Rather, it gives us the sense that we have arrived and that we do not need further growth. Now a question arises, if falling in love is not real love, what is it? Real love is emotional in nature but not obsessional. It is a love that unites reason and emotion. It involves an act of the will and requires discipline and it recognizes the need for personal growth. Out most basic emotional need is not to fall in love but to be genuinely loved by another, to know a love that grows out of reason and choice, not instinct. I need to be loved by someone who chooses to love me, who sees in me something worth loving. The emotional need for love must be met if we are to have emotional health. Married adults long to feel affection and love from their spouses. We feel secure when we are assured that our mate accepts us, wants us and is committed to our well-being. During the in-love stage, we felt all of those emotions. It was heavenly while it lasted. Our mistake was in thinking it would last forever. But that obsession was not meant to last forever. In the text book of marriage, it is but the introduction. The heart of the book is rational, volitional love. That is the kind of love to which the sages have always called us. It is intentional. This kind of love begins with an attitude – a way of thinking. Love is the attitude that says, ‘I am married to you, and I choose to look out for your interests’. Then the one who chooses to love will find appropriate ways to express that decision. 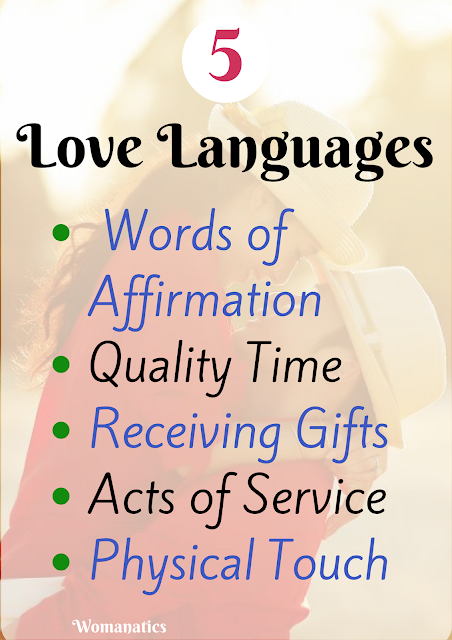 The Five Love Languages – these are the ways a person feels loved. If you discover your spouse’s primary love language, you can make him/her feel loved, wanted and happy! The object of love is not getting something you want but doing something for the well-being of the one you love. It is a fact, however that when we receive affirming words we are far more likely to be motivated to reciprocate. Gary says words of affirmation may have many different dialects. In order to speak your spouse’s language of words of affirmation, one must learn the proper dialect as well. Remember, words are important! Write a love letter or a love paragraph. Compliment your spouse in the presence of his or parents or friends. Look for your spouse’s strengths and tell him/her how much you appreciate those strengths. 2) Quality Time – It means giving your spouse undivided attention. Like words of affirmation, the language of quality time has many dialects. One of the most common dialects is that of quality conversations. While words of affirmation focus on what we are saying, quality conversations focus on what we are hearing. It means a sympathetic dialogue where two individuals are sharing their experiences, thoughts, feelings and desires in a friendly, uninterrupted context. A central aspect of quality times is togetherness. It does not mean proximity.. Togetherness has to do with focussed attention. Another dialect is quality activity. It means anything in which one or both of the partners have an interest. The emphasis is not on what you are doing but on why you are doing it. 3) Receiving Gifts – A gift is something you can hold in your hand and say ‘look, he/she was thinking of me’. Visual symbols of love are more important to some people than to others. That’s why individuals have different attitudes towards wedding rings. Some never take the ring off after their wedding. Others don’t even wear a wedding band. To the individual whose primary love language is receiving gifts, the cost of the gift will matter little, unless it is greatly out of line with what you can afford. When family finances are limited, one dollar gift may speak a million dollars worth of love. If you discover your spouse’s primary love language is receiving gifts, then perhaps you will understand that purchasing gifts for him or her is the best investment you can make. You are investing in your relationship and filling your spouse’s emotional love tank, and with a full love tank, he or she will likely reciprocate emotional love to you in a language you will understand. When both persons’ emotional needs are met, the marriage will reach whole new dimensions. 4) Acts of Service – ‘Requests give direction to love, but demands stop the flow of love’. Love is a choice and cannot be coerced. Criticism and demands tend to drive wedges. With enough criticism, you may get acquiescence from your spouse. He may do what you want but probably it will not be an expression of love. If your primary love language is acts of service, and you get pleased if your spouse does things for you, it is better to ask or request for them and not to demand. Do some major acts of service like washing the car, cooking a meal, painting a bedroom, or washing the deck to make your spouse feel that you care for him. If you have more money than time, hire someone to do the acts of service that you know your spouse would like for you to do. If you take the responsibility for getting it done, you will be speaking love even when you are away. 5) Physical Touch – It is a proven fact that babies who are held, hugged and kissed develop a healthier emotional life than those who are left for long periods of time without physical contact. Physical touch is also a powerful vehicle for communicating marital love. Holding hands, kissing, embracing are all ways of communicating emotional love to one’s spouse. A slap in the face is detrimental to any child but it is devastating to a child whose primary love language is touch. If your spouse’s primary love language is physical touch, nothing is more important than holding her as she cries. Almost instinctively in a time of crisis, we hug one another. Why? Because physical touch is a powerful communicator of love. In a time of crisis, more than anything, we need to feel loved. We can not always change events, but we can survive if we feel loved. Discovering the primary love language of your spouse is essential if you are to keep his/her emotional love tank full. But first, make sure you know your own love language.